Military Declaration? Stop dropping the ball! There are tensions near un-Walled border as a number of Caravan start to arrive and Stephen Miller is really confused with both Kelly as well as Nielsen. Some of the White House supports and other external advisers supporting president immigration agenda were at a meet on Monday that created depression among Trump’s aides. Both Kelly along with Nielsen argued against the signing of declaration that featured military broad authority and informed president this move was over the constitutional powers. Mike Pence, the Vice President was also present at the meeting, but he did not take any stand related to this issue. 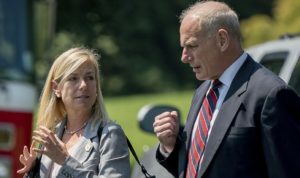 The meeting ended with a bitter note as both of them were in president’s position after Kelly signed the Cabinet declaration related to sending military this disputed authority after, on Trump’s orders. Emmet Flood, a counsel from White House also warned about the roadblocks that this declaration would come into.